There are 4 project sites. Ülgase Natura 2000 site (EE0010116) covers the bats' wintering and swarming site which is used by the Pond Bat (Myotis dasycneme). The hibernation site is an abandoned mine where phosphorite was extracted in 1921-1938. The mining resulted in underground passages which are over 4 km long. In 2004, the abandoned mine was studied geodetically and the passages were measured. According to this study, the passages are stable and there have been no significant falls of material since the end of mining operations. Ülgase cave is a large hibernation site of boreal bats. Bats are known to hibernate here since the 1960s. Regular counting of hibernating bats started in 1978. Six species of bats have been found there: Myotis dasycneme, Myotis brandtii, Myotis daubentonii, Plecotus auritus, Eptesicus nilssonii, Myotis nattereri. Hibernation of Myotis mystacinus is also probable as it is difficult to distinguish from Myotis brandtii. The total number of hibernating bats was 1067 in 1994 (including 124 individuals of M. dasycneme). Ülgase is one of the two bat hibernation sites in Estonia where the number of hibernating individuals has been over 1000. The number of bats hibernating in this site is decreasing: the total number was 286 in 2005 (incl. M. dasycneme: 80), 214 in 2010 (incl M. dasycneme 44) and 216 in 2016 (incl. M. dasycneme: 57). Human impact is high, with considerable increase in the last 10-20 years. Even signal flares have been used inside the caves. High human impact is the most probable reason for the decline in hibernating bats' numbers. 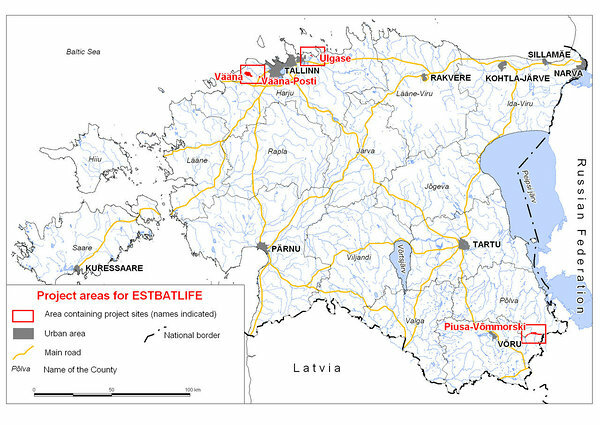 The bat hibernation site of Vääna-Posti consists of two underground tunnels of 200 and 600 metres and has the lowest human disturbance among the bats' wintering sites in Estonia. Disturbance is lower in cave No 2 as a result of difficult access. The surrounding area is protected as the species' protection site for bats. Every year 500-600 bats of five species hibernate there: Myotis dasycneme, Myotis daubentonii, Myotis bradtii, Plecotus auritus, Eptesicus nilssonii. The number of Myotis dasycneme was 108 in 2015 while it has been over 160 in earlier years. In addition to hibernation, the surrounding area of the caves of Vääna-Posti is used for swarming and foraging by bats. Underground tunnels at Vääna project site, also referred as Humala form an important hibernation site of bats. Five bat species have been found hibernating in Humala: Myotis dasycneme, Myotis daubentonii, Myotis brandtii, Plecotus auritus, Eptesicus nilssonii. The number of hibernating Pond Bats was 32 in 1967, but only 14 in 2014. The main reason for decreasing numbers of hibernating Pond Bats is the excessive human impact: lot of visitors in winter and opening too many entrances to underground tunnels. The caves of Piusa in South-East Estonia are old sandstone mines. As a result of mining that lasted since 1922 until the beginning of 1970s five separate caves were formed within a small area. The caves offer favourable hibernation conditions to bats, according to Estonian Environmental Information System, the total length of the Piusa caves is 20 km. Since 1949 seven species of bats have been found there: Myotis dasycneme, Myotis daubentonii, Myotis brandtii, Plecotus auritus, Eptesicus nilssonii, Myotis mystacinus and Myotis nattereri. In three smaller caves which were cut before 1940s the number of Myotis daubentonii started to increase in 1970s and the beginning of 1980s. In the biggest cave where the mining was finished only in the beginning of 1970s the number of Myotis daubentonii and Eptesicus nilssonii began to grow from the winter of 1984/85. There is also noticeable a slow growth in the number of Myotis brandtii and Myotis dasycneme. The general number of bats has exceeded 4500 by 2001, followed by decrease in 2000s due to higher visiting pressure. After the opening of visitor's center and some efforts in management of visitor flows since 2010 the number of hibernating bats has started to increase slowly.